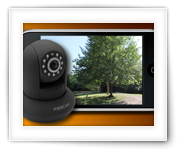 You might have read the articles on using your old phones as IP Camera monitors (Android, iPhone), so you can imagine that it didn’t take me much time to set them up as IP Camera’s as well. After all: these smartphones are pretty capable devices and do come with a build in camera, often better than the camera’s build in dedicated IP Camera’s like my Foscam IP camera’s. 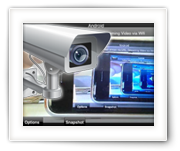 In this article I’ll show you how to repurpose your old Android phone as an IP Camera, so you can remotely monitor for example your house, your baby, etc. With the average “life-span” of a cellphone (the time we actually use the phone) of 1 to 2 years, a lot of folks should have “old” phones in their drawers. Quite a few of those could be smartphones, which can in fact be seen as computers. They most certainly outperform my first PC’s with ease so wouldn’t there be good ways to repurpose our “old” smartphones? I already used this kind of setup for my old iPhone – so I decided to do the same thing for one of my old Android phone (the Samsung has a much nicer screen than my old iPhone).